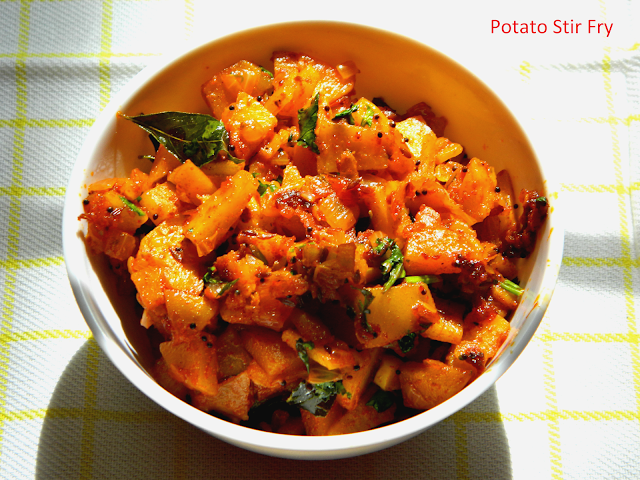 Batata - Potato stir fry is one quick side dish option for which you can go for when you hardly have any vegetables left in your refrigerator. You need not have to boil the potato unlike we do for the Poori potato sabzi. It's just to chop the potato into small sized slices so that it gets cooked fast, add the required amount of red chilli powder, add the roasted groundnut powder (Shengadanyach koot - a must ingredient for Maharashtrian dish ;)) and give a stir. Cook it well with the closed lid and server it hot with Chapati/roti. Potato - 2 big chopped into thin small slices. Coriander - 1/2 tbsp for garnishing. 1. Finely chop the onion and potato into thin small pieces. Soak the potato slices in water to prevent oxidation. 2. Heat oil in a heavy bottomed pan, add the cumin & mustard seeds allow it to crackle. 3. Add ginger garlic paste, asafoetida, curry leaves. 4. Add the chopped onion and cook until translucent then add the turmeric powder. 5. Add the chopped potato slices. 6. Add red chili powder, salt, sugar and give a stir. Mix well all the ingredients. 7. Close the lid of the vessel and cook this for around 3-4 mins. 8. Add the roasted ground nut powder, mix well and close the lid. Allow this to get cooked for again 4-5 minutes by stirring in between. 9. Garnish with coriander and Server this hot with Chapati.